Buy the NFPA 13: Installation of Sprinkler Systems and Handbook Set and Save 15%. Install automatic fire sprinkler systems correctly so they're ready for action. 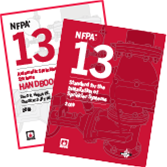 Save 15% on the 2019 edition of the NFPA 13 and Handbook Set. NFPA 13 has been updated for 2019, and this money-saving NFPA Set prepares you to apply the reorganized Standard correctly and confidently on the job. Reorganized based on user needs in the built environment, NFPA 13, Standard for the Installation of Sprinkler Systems, is the leading resource for sprinkler protection. Its essential companion, the 2019 edition of the Automatic Sprinkler Systems Handbook, is packed with color visuals, detailed information, and expertise from industry authorities, so you're ready to conduct more accurate and efficient system design, installation, and testing. This NFPA Set helps designers, installers, maintainers, and AHJs safeguard people and property against fire and keep projects in compliance, on time, and on budget. Improve automatic fire sprinkler effectiveness and avoid errors with the 2016 NFPA 13 and Handbook Set. Save 15%! Get equipped for today's hazards by staying up-to-code with the new industry standard for automatic sprinkler systems. The 2016 edition of NFPA 13: Standard for the Installation of Sprinkler Systems reflects innovative technologies and applications. Its essential companion, NFPA's 2016 Automatic Sprinkler Systems Handbook, is packed with valuable expertise from leading authorities, color visuals, and information that prepares you to conduct accurate and efficient system design, installation, and testing. Gain the edge in sprinkler protection with the time- and money-saving 2016 NFPA 13 and Handbook Set. Ensure accurate and compliant automatic sprinkler systems. Save 15% on the 2016 NFPA 13 Set. The 2016 edition of NFPA 13 advances how sprinkler system designers, installers, maintainers, and AHJs can safeguard people and property against fire, and the NFPA 13 Handbook helps you keep projects in compliance, on time, and on budget.